Not my favourite Yesshow of all time. Indeed, probably my least favourite, frankly. After a stunning performance in Brighton, the band were evidently much more focussed on the end of the tour than on the tour itself. 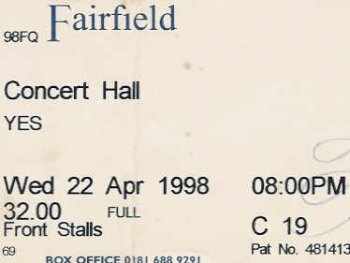 The Fairfield concert hall is not terribly inspiring as venues go, but this gig was added on to the schedule fairly late in the piece and was heavily plugged. 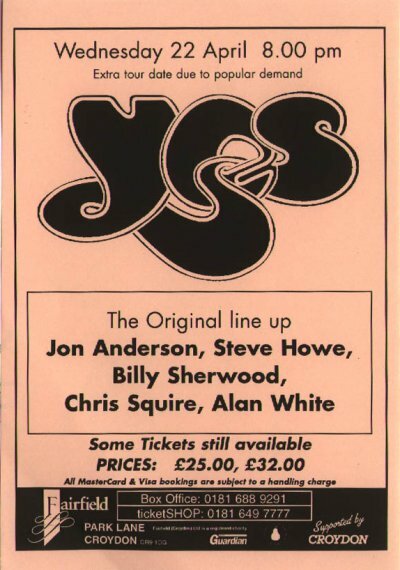 The ticket prices were actually higher than those at any other venue on either of the UK legs - and quite a number of people milling around the bar beforehand had stories about "deciding to go because of the good reports I'd heard on the grapevine", as someone put it to me. All of which added to the disappointment, really. The band dropped FTB (unsurprisingly), RSoG (unforgivably - in my book anyway) and Starship Trooper (to the disappointment of many). The rest of it was OK, though Steve Howe fluffed quite a bit on Mood for a Day - which he followed with a brief John Dowland excerpt, Chet Atkins' 'Warm and Windy', and the obligatory Clap. No surprises, other than that. I suspect Squire and White were the prime movers in abandoning 'The Revealing', given how wiped-out they looked the day before after the Dome show... and how this song's not nearly as significant to them as it is to Anderson and Howe. They were not too wrecked to spare us their own over-indulgent solos, however. Interesting priorities. Steve looked faintly uneasy when Jon went into his 'singalong' AGP routine straight after OoaLH. And rightly so. Shame on them. I'm aware of all the arguments that will be trotted out in Yes' defence, of course: it's been a long tour, they're fatigued, they have a right to vary the set-list... and so on and so on. But I still think that chopping *forty minutes* off a gig that's twice the price of most other rock concerts (and is the penultimate night of the first tour of their home country in seven years) comes close to showing contempt for your audience. I've been fortunate enough to see a lot of this tour, but I could only feel sympathy for people who chose this as their one experience, or who particularly wanted to hear RSoG. Ironically, Jon had earlier remarked (rather lamely, for anyone who knows the place), that "we've always wanted to play Croydon." Curious way of showing it. Having said that, I personally enjoyed having Roundabout as the last song. ST has been in danger of getting too big for its own boots, and if the band needed to take a slightly earlier night for once, then it was at least a defensible sacrifice. FTB, too, is barely here or there in the overall scheme of thins. But RSoG is the highlight of the concert - and a piece which they haven't aired for 22 years. Not having it ripped the guts out of the whole event for me, and I suspect for many others. Other matters: There were a couple of humourous moments towards the beginning of this abbreviated set, when Jon's blue tambourine dislocated itself from the mike stand, and a tech called Robbie graciously endured the resultant ribbing. Steve Howe also reminded us that he, at least, knew the Fairfield Hall from a previous encounter - with Bonnie & Delaney, Ginger Baker and Eric Clapton in December 1969. His role on that occasion had been to introduce the band, rather than to play in it! He further dedicated 'Mood' to two friends at whose wedding he had once performed it, Jane and Duncan. Altogether then, not one of the most auspicious moments in Yes history. Let's hope they pull out the stops again for the final fling in Hammersmith tonight.